Hydration free energy calculations have become important tests of force fields. Alchemical free energy calculations based on molecular dynamics simulations provide a rigorous way to calculate these free energies for a particular force field, given sufficient sampling. Here, we report results of alchemical hydration free energy calculations for the set of small molecules comprising the 2011 Statistical Assessment of Modeling of Proteins and Ligands challenge. Our calculations are largely based on the Generalized Amber Force Field with several different charge models, and we achieved RMS errors in the 1.4–2.2 kcal/mol range depending on charge model, marginally higher than what we typically observed in previous studies (Mobley et al. in J Phys Chem B 111(9):2242–2254, 2007, J Chem Theory Comput 5(2):350–358, 2009, J Phys Chem B 115:1329–1332, 2011; Nicholls et al. 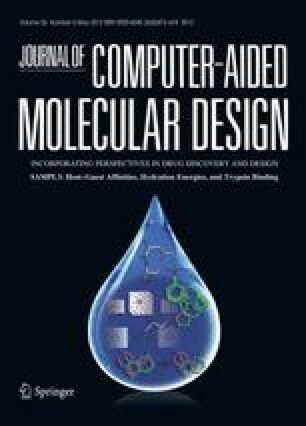 in J Med Chem 51:769–779, 2008; Klimovich and Mobley in J Comput Aided Mol Design 24(4):307–316, 2010). The test set consists of ethane, biphenyl, and a dibenzyl dioxin, as well as a series of chlorinated derivatives of each. We found that, for this set, using high-quality partial charges from MP2/cc-PVTZ SCRF RESP fits provided marginally improved agreement with experiment over using AM1-BCC partial charges as we have more typically done, in keeping with our recent findings (Mobley et al. in J Phys Chem B 115:1329–1332, 2011). Switching to OPLS Lennard–Jones parameters with AM1-BCC charges also improves agreement with experiment. We also find a number of chemical trends within each molecular series which we can explain, but there are also some surprises, including some that are captured by the calculations and some that are not. The online version of this article (doi: 10.1007/s10822-011-9528-8) contains supplementary material, which is available to authorized users. DLM and SL acknowledge the Louisiana Board of Regents Research Competitiveness and Research Enhancement Subprograms as well as the Louisiana Optical Network Initiative (supported by the Louisiana Board of Regents Post-Katrina Support Fund Initiative grant LEQSF(2007-12)- ENH-PKSFI-PRS-01), and the National Science Foundation under NSF EPSCoR Cooperative Agreement No. EPS-1003897 with additional support from the Louisiana Board of Regents. DSC acknowledges the help of David A. Case (Rutgers) in developing the solvent reaction field QM calculations, and the support of NIH grants RR12255 and RR05969 (to Dr. Case).